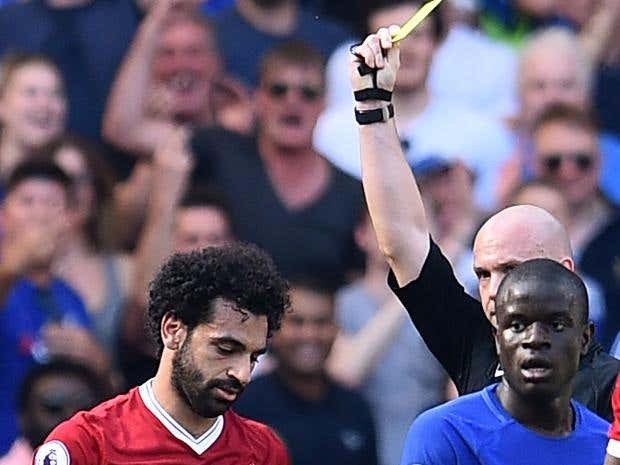 Liverpool manager Jürgen Klopp has warned Mohamed Salah not to develop a reputation for diving after the Egyptian was shown his first yellow card of the season for simulation in the 1-0 defeat away at Chelsea. Salah was booked for going to ground in a challenge with Gary Cahill in the first half of a frustrating game for the striker, who barely had a scoring chance. Klopp pointed out that, while bookings are undesirable in themselves, referees are also wary of giving decisions in favour of those they think likely to dive. “Yes I think it was a dive, wasn’t it?” Klopp said. “Or he waited for the contact, I am not sure, so that is not what I want to see, that is not what he wants to do. Chelsea did better against their former striker than AS Roma, his previous club, had in the Champions League semi-final, but Klopp pointed out that he had endured rough treatment in both games. The result means that the gap between the clubs is now down to three points, Chelsea having a game in hand but an inferior goal difference, with Tottenham a point behind the Reds. Liverpool face Brighton at Anfield on Sunday while Chelsea host Huddersfield then visit Newcastle, and Klopp insists that his team has the advantage. Chelsea manager Antonio Conte recognised the reality that his men have an uphill task to claim fourth place, but remains positive.